Find a world-class cardiothoracic surgeon. North Shore Medical Center (NSMC) patients who require cardiac surgery will have the surgery with a cardiothoracic surgeon at Massachusetts General Hospital (MGH). NSMC has had a deep collaboration with Massachusetts General Hospital from several decades, with NSMC cardiologists working side by side with Mass General cardiologists at the NSMC Heart Center. Cardiothoracic surgeons at MGH treat adult congenital heart disease, aortic aneurysms, heart failure, heart rhythm conditions and heart valve conditions. Many cardiothoracic conditions can be treated with minimally invasive techniques. Because these procedures involve small incisions and do not require the chest to be opened, patients experience a much shorter recovery time, less pain, have shorter hospital stays and a reduced chance of infection and complications. 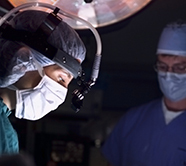 A cardiothoracic surgeon may use minimally invasive techniques to diagnose infections and tumors, conduct biopsies, repair heart valves, perform esophageal surgery. Minimally invasive surgery is also used during lung cancer surgery, and during thoracic outlet syndrome treatment. Learn more about cardiothoracic surgery and the many other surgical procedures provided by NSMC physicians, including bariatric surgery, cancer surgery, colorectal surgery, neurosurgery, and surgeries for weight loss, including the gastric sleeve procedure.